"One of the best ways to make money with your websites is building a ‘community’ and Viral Loop makes that super easy. It's easy to setup and even easier for visitors who come to your website to join and start creating content for you. If you want to build a profitable community around your website I recommend using Viral Loop." "Having a viral traffic strategy is more vital to website owners than ever before, I'd say, even more than SEO. With search engine's relying more & more on social media, social proof based on the word of mouth sharing - everyone should be taking advantage of any and every opportunity to make the most of viral traffic methods like these." Q: Do I need to have any technical ‘know how’? A: Nope! I made sure everything is super simple to follow – so not only is everything point and click… we have included full training to make sure you know exactly what you’re doing, every step of the way. 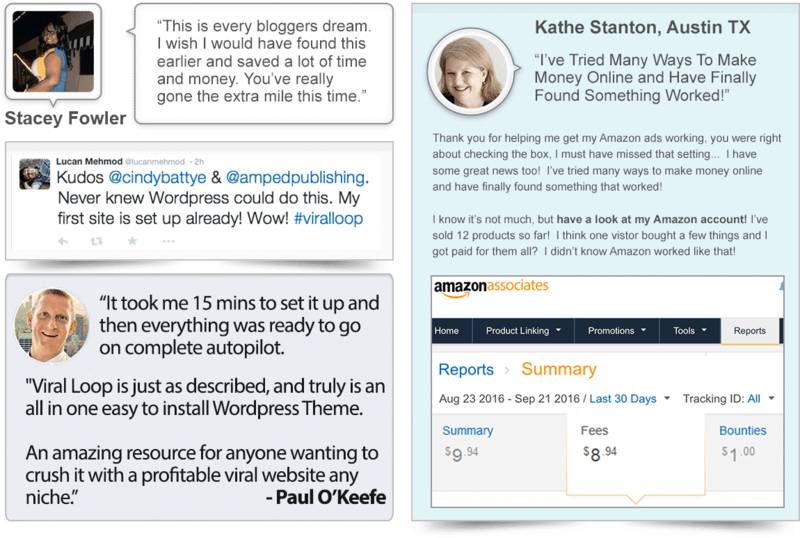 A: I KNOW you’re going to love ViralLoop and the results it generates for you – so I’m HAPPY to offer a 30 day money-back guarantee. If you’re unhappy for ANY reason, simply contact my support desk and we will refund you 100% of your money back, no questions asked. Q: How does this generate me traffic and not just content? A: Fresh content is VITAL for ranking high on search engines. All content is created with keyword targeting in mind, further boosting your SEO rankings AND benefiting from the built in viral sharing too! Q: What if I don’t already have a blog? A: Don't worry, this is the easiest theme to use, there are no extra plugins to install and most settings are already included by default, and easily switched with our one click template system – and if you DO get stuck, our friendly team are ready to help. Q: Is viral traffic really that good? A: YES. It’s 100% free, and exponential traffic that just keeps coming and coming… what’s NOT to like? !